Enjoy luxury Bed and Breakfast accommodation at Radfield House, one of Blenheim"s more gracious properties which is listed with the Historic Places Trust. It is the perfect setting for a weekend break in Blenheim, honeymoon or stay longer and enjoy all that this amazing region has to offer. Homely, modern Bed and Breakfast accommodation,situated on Wither rise with superb views over Blenheim. Home studio of well known New Zealand artist Brian Baxter. Relax in quality self-contained accommodation 5km south of Picton in the picturesque Koromiko valley. Hire one of our two-seater classic-style sports cars and tour Marlborough in style. The Peppertree luxury bed and breakfast is located in 10 acres of lush farmland. The timeless feel of this beautiful hotel accommodation flows through into each of the five guests suites, where the ambiance of an open fire prevails. The homestead is a classic New Zealand farm house built in the 1880s and was once the focal point of a large farm complex. The Homestead and Self-Catering Cottage Accommodation now form a unique collection of traditional buildings that have retained their original charm and yet provide up-to-date facilities. The views are wonderful and the settings private. Paul and Daphne live in the Homestead and welcome visitors to share their little bit of heaven. Enjoy our expansive lawns and rose gardens and unwind on our garden furniture. 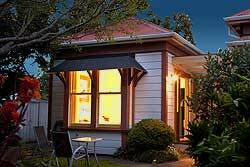 Within five minutes walk to the Kaikoura Township and all local sightseeing attractions. Fernview Cottage is a beautifully restored historic villa built in the early 1900's. It is nestled in a private and peaceful part of the seaside town of Picton overlooking a large domain with native forest views, it is also a stones throw from Picton's picturesque marina. Owned and operated by Carlie and Greg. Both have had many years working in the hospitality and tourism industry here in New Zealand as well as abroad. Picton's finest Heritage listed two-storey colonial villa offers unique accommodation set in extensive grounds only a stroll to Picton centre. Three apartments with character & charm, private entrances, sunny verandahs and breakfast provisions. Located in Renwick in the centre of the Marlborough Wine District. Stay in a peaceful character garden. Relax with a glass of wine in our outdoor bbq area & spa with views to the Richmond ranges. Complimentary cycle hire for guests. We are located in mature native beech forest in the village of St Arnaud, just 600 metres from Lake Rotoiti in Nelson Lakes National Park. In keeping with our magnificent native bush covered mountains, St Arnaud House is a solid eco-timber Fraemohs building, which blends into the stunning Nelson Lakes alpine environment. St Arnaud House provides the perfect base for many activities and adventures available in the surrounding area. At Antares you will find relaxed hospitality in a beautiful and secluded native garden situated in the heart of the famous Marlborough Vineyards. Enjoy our hot tub or heated pool whilst sampling a glass or two of the local wine. Driftwood Beach beachfront B&B is a quiet and peaceful place where the only sound is the waves breaking on the shore. Rarangi Beach is only 10 minutes drive from Blenheim in the heart of Marlborough's wine country, New Zealand. Experience something special in our own private wilderness paradise. Ngaio Bay is beautiful, peaceful, with its own private sandy beach and is situated in a truly remote part of the Marlborough Sounds. Enjoy the unique charm of Anglesea House, a spacious Edwardian Villa that combines stylish comfort with an elegant décor to create a gracious, relaxing ambience. Hillsfield House is tucked in an olive grove just ten minutes from central Blenheim in the heart of the majestic Wairau Valley in Marlborough. Hillsfield House Bed and Breakfast accommodation in Renwick offers guests a haven of seclusion and serenity. Hillsfield House accommodation has 2 rooms; 'The Loft' and 'The Courtyard', both tastefully and elegantly furnished. Both rooms have private entrances, nestled in a pavilion separate to that of your hosts'. Make yourselves at home, knowing that you are free to come and go as you please with the added pleasure of having your breakfast served in your room to suit your relaxation or travel plans at a time of your choosing. Tirimoana beachfront lodge is a luxury boutique accommodation with sweeping views of Marlborough Sounds from all suites including the self contained accommodation. The lodge is 30 minutes from Picton and a stroll from Queen Charlotte Track & jetty. Our self-contained unit can accommodate one couple and is a modern addition to our 100 year-old home, which is listed with the Historic Places Trust as a category B historic building. Features include your own entrance, queen-size bed, mini kitchen, large bathroom - bath, shower and a separate toilet. Electric blanket, heated towel-rails and hair dryer included. Laundry facilities available. Breakfast is self-serve continental in your unit and can be taken at your leisure. Sounds Luxury Bed and Breakfast offer beautifully furnished rooms with stunning panoramic views over the Marlborough Sounds and the Waikawa Marina.Superb hilltop situation.Chance to visit Ross Crump,carver of black and green jade in his own workshop. Luxury homestay accommodation in 1877 homestead - Marlborough Bed & Breakfast conveniently located just off State Highway 1 at Tuamarina between Blenheim and Picton. This fully restored former convent was built in 1901 and is set on 60 acres of vineyards and parklands. McCormick House Luxury Bed and Breakfast in Picton, Marlborough, NZ. Historic Picton home set on large private native garden. Three ensuite rooms, super king bed, spa bath, separate guest dining /lounge, alfresco breakfast. Enjoy the breathtaking views of the Marlborough Sounds in our charming Bed & Breakfast set in 3 acres of wonderful terraced gardens filled with native flora and fauna. Ideally situated to access all the sporting activities that the Sounds have to offer. Luxury bed and breakfast accommodation in Kaikoura. Historic villa, lverlooking the picton Marina,just 5 minutes walk time from the town centre. We have a double room with a queen bed plus a twin room each with their own ensuites. Luxury, spacious and peaceful apartments on the Kaikoura Peninsula with a panoramic view and central to all major attractions. Walking distance to the seal colony and the start of the beautiful coastal walkway.